Tasty chicken recipes for lunch and dinner. When I go out for Thai food, there are two buzzwords that usually draw me in to trying a new dish…coconut and curry. While I’m not a huge fan of spicy food, there are times when I just need a hot bowl of curry in my life…and even better when it’s seasoned with creamy coconut milk. This amazing chicken recipe is the best of both worlds. It has delicious curry flavor and a creamy coconut tomato sauce, and the heat can be adjusted to your liking. The recipe as is has practically no heat from spices, but you can easily add Thai chilies or chili paste to up the heat of this curry dish. Serve it with rice or a big ol’ slice of naan for a delicious meal that’s perfect for this cool pre-winter weather! Cut chicken tenders into small bite-sized chunks. Season with salt and pepper. I also added a little curry powder to the chicken, just because I love it! Heat a large stock pot over medium-high heat. Add oil and curry powder. Heat curry oil for 1 minute. Add chicken to oil, followed by onions. Cook 7-10 minutes, or until chicken is no longer pink in the middle and the juices run clear. Add chopped garlic. Cook an additional 1-2 minutes. ENJOY THE SMELLS. This dish smells AMAZING as it cooks. Add the coconut milk, diced tomatoes, tomato sauce, and sugar. Stir to combine. Turn the heat down to medium low and cover the pot. Let simmer, stirring occasionally, for 30-40 minutes. Serve as is or over a bowl of rice. Can I just take a moment and share my love of one-pot meals? Less dishes, less prep…just chop, drop and plop it in the oven and, in about an hour, you have a delicious meal ready to go. Usually my one-pot meal consists of throwing everything in my fridge in the slow cooker and hoping for some type of chili or soup to magically create itself, but the other week it was just too hot to have the slow cooker going all day…so I had to resort to the roasting pan. I had some chicken thighs that were pushing their “good-by” date, so I grabbed some potatoes and tried to whip up a honey-mustard sauce…but I was out of honey. So, maple syrup it was! 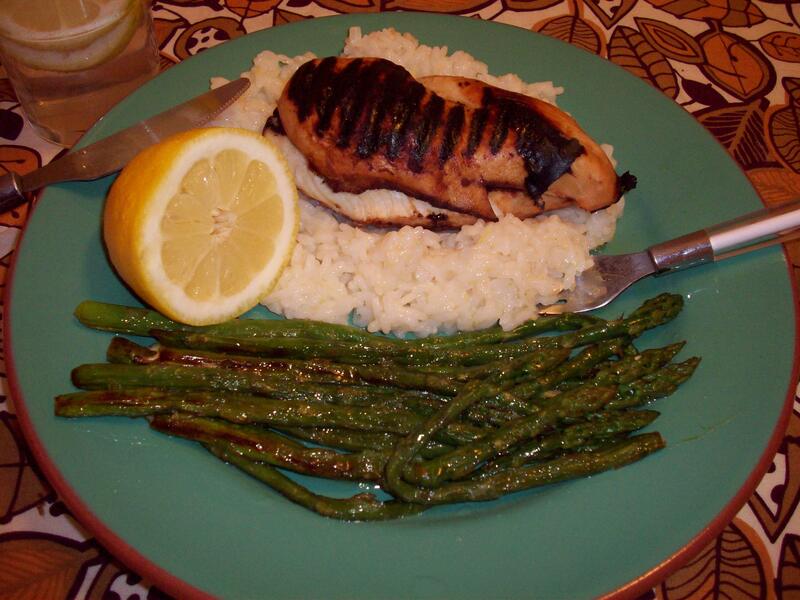 The sauce for this chicken turned out to be a little sweet, but I still really liked it! You can use whatever mustard combination you’d like…I literally grabbed all the mustards in my fridge and said, “to hell with it!”. This is a really good recipe for dark chicken on the bone, as the rich flavors of the dark meat pair really well with the bright flavors of the sauce…but if you’re not a dark meat fan, I’m sure this would be equally as tasty with white meat, too! Season potatoes with parsley, paprika, salt, pepper and olive oil. Toss to coat. Pour into casserole dish with chicken. In small bowl, combine Dijon mustard, yellow mustard, brown mustard and maple syrup. Whisk until combined. Pour mustard mix over chicken and potatoes. Toss to coat (I got in there with my hands and just mixed everything together). Bake for 50 to 60 minutes, or until chicken registers done on the meat thermometer. *If you’re using skin-on chicken thighs and want to sear the skin side before adding to the casserole dish, I highly recommend doing that. I didn’t do that for this dish, but I’ve done it for other one-pot dishes and it’s so delicious! I try to serve foods themed around the Best Picture nominees, and for the amazing film, Moonlight, I decided to create my own version of Kevin’s (Andre Holland) chef special, Chicken and Rice. Served with fresh cilantro and black beans, this Arroz con Pollo recipe is a light and refreshing dish that has a bright burst of citrus flavor. You can use brown or white rice (make sure to cook it ahead of time!) and you can add a deeper chicken flavor to this dish by using chicken thighs and legs instead of breasts. A spicy and tasty dinner that’s big enough to feed 6-8 hungry mouths, this Arroz con Pollo recipe is a great one to have in your back pocket for last-minute dinner parties or gatherings. Cut chicken into 1 in. cubes. Heat oil in pan and cook chicken on all sides until lightly browned. Add onion and garlic; stir until fragrant and onions have softened. Add chopped jalapeno, chicken broth, chopped cilantro, lemon zest and juice of lemons, and lime zest and juice of limes. Salt and pepper to taste. Cover and cook over medium heat for 10 minutes, or until the chicken is fully cooked. Add cooked rice; mix to combine. Add corn and beans. Reduce heat to low and cook for an additional 10 minutes, or until heated through. Serve in pot or transfer to casserole dish. Garnish with additional chopped cilantro and sliced jalapeno. Whether you’re just getting started in the kitchen or you’ve been cooking for several years now, I think we can all agree that one of the greatest canvases for experimenting with flavors is the good ol’ fashioned chicken. If you get your chicken from a local farm or market, a little salt and pepper is really all you need to season your meat. However, not all of us have that luxury…at least not at all times of the year…so we’re stuck with buying flavorless bland chicken that begs to be seasoned, brined, and fried. But not all hope is lost! If you’re on the hunt for recipes to help liven up your dinner line-up, here are 10 of my favorite chicken recipes. Packed with flavor, texture, and amazing color, these easy dinner recipes are great for weeknight meals for two, four, or ten! Check out more of my favorite chicken and dinner recipes on my Pinterest board, Favorite Recipes! Looking for fun ways to jazz up your chicken tonight? Well, you’ve come to the right place! 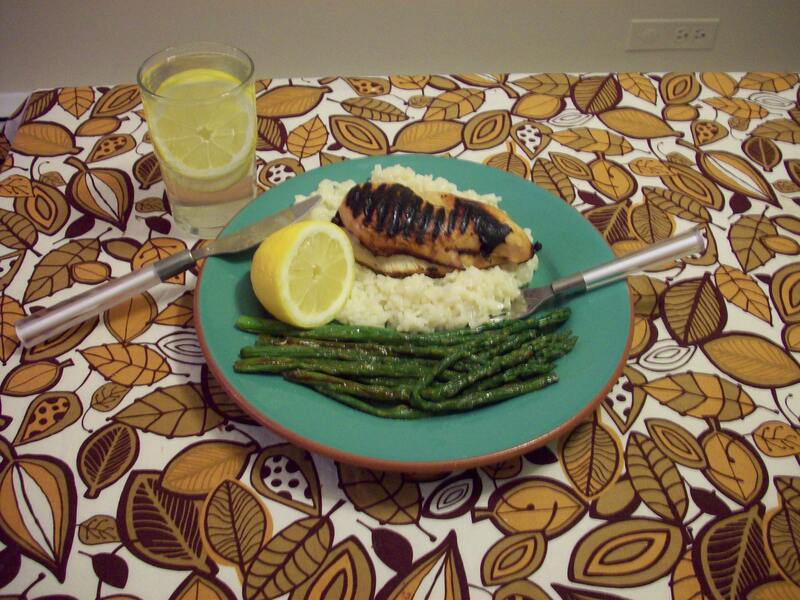 This simple yet delicious meal was a cooking experiment that turned into something amazing. With chicken, pitas, red bell pepper, and goat cheese, you can have an easy and quick dinner any day of the week! Place chicken on a cutting board. Mix salt, pepper, cinnamon, cumin, paprika, and garlic powder in a small bowl. Once combined, sprinkle over chicken on both sides. Using an indoor grill, an outdoor grill, a Foreman grill, or just a skillet, cook the chicken until juices run clear (cooking time will vary depending on the thickness of your chicken breast. Butterflied chicken usually cooks much quicker, so be sure to watch it carefully so as to not overcook). Once chicken is fully cooked, set it aside to rest for 5-10 minutes. Then slice into bite-sized strips. Place red bell peppers on the grill and top each slice with a teaspoon or so of goat cheese. Cook on the grill until cheese begins to melt. When you’re ready to eat, heat up your pitas in the microwave for about 10 seconds. Fill with chicken and cheesy peppers. Serve with rice or salad. 1. Preheat oven to 400 degrees. Place cleaned chicken in a roasting pan and season with salt and pepper. Bake for 20 minutes. 2. 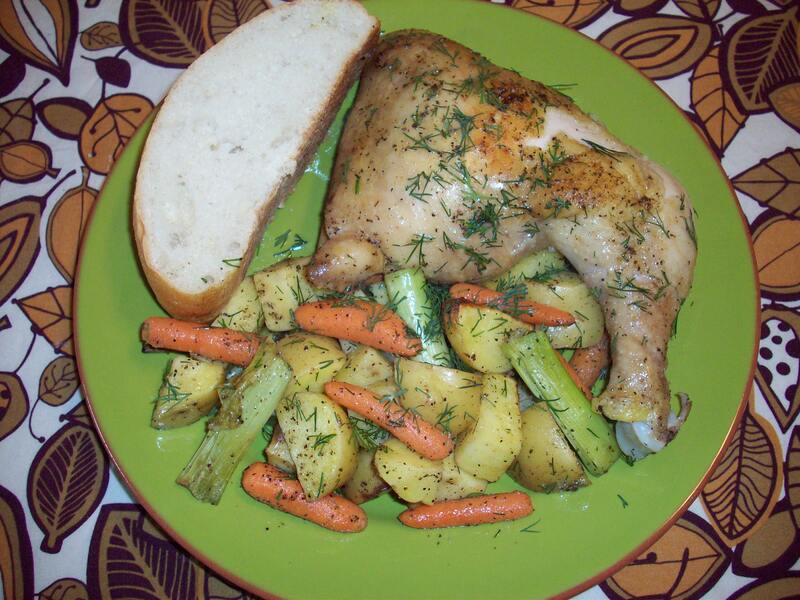 While your chicken is cooking, chop potatoes and scallions and mix with carrots, salt and pepper, and olive oil. 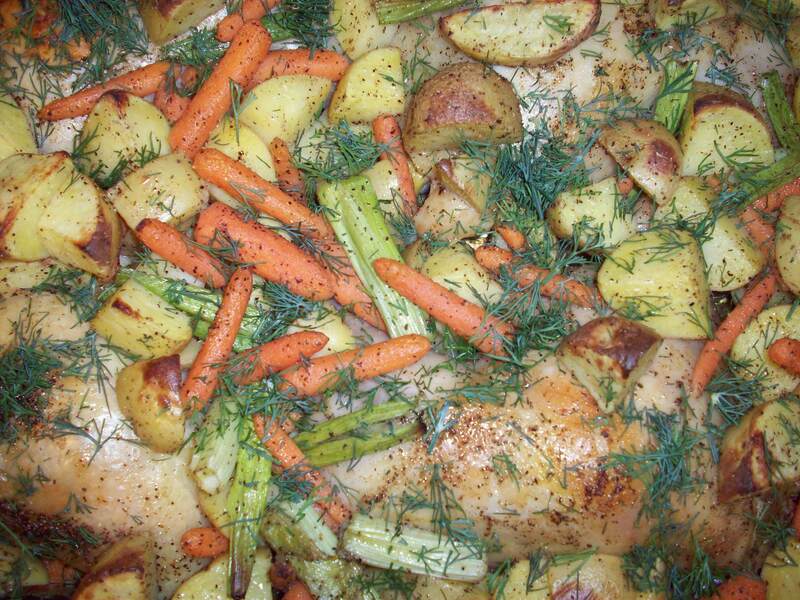 Remove chicken from oven and add veggies to the roasting pan. Let chicken and veggies cook an additional 20 minutes, or until chicken is fully cooked and veggies are tender to the touch (the meat might be done before the veggies…if so simply remove the chicken). 3. Sprinkle with chopped thyme and enjoy! I love lemons! And this dish has is jam-packed of lemon goodness! Combine first 7 ingredients in a large zip-top plastic bag. Add chicken; seal and marinate in refrigerator 3 hours, turning bag occasionally. Remove the chicken from bag; discard marinade. Grill, bake, or cook in George Forman grill. In a large pan, on high heat, add asparagus, olive oil, and water. Cook until tender, about 5 minutes. Remove from pan and sprinkle with fresh lemon juice, salt, and pepper. Place water in a pot and bring to a rapid boil. Add rice, cover pot, and turn heat to low. Let cook for 20 minutes. When fully cooked, remove lid and fluff rice with wooden spoon or fork. Add lemon juice and zest right before serving. This rice is VERY lemony…so if it’s too strong, try using less zest, since that’s where the strongest flavor comes from.